I bought Moxie a few bottles of Pinot Gris at Christmas, she was making white Sangria. As usual, I overbought. This one broke the bank at $13. It has a peachy yellow color to it and a nose of lemon peel, pineapple and ginger. On the palate it is very approachable. Refreshing citrus, not overly acidic with hints of beeswax and more of that ginger, but like ginger-ale, not the sliced and raw version. The wine slides nicely without being tart or bitter. It offers a nice mid palate waxiness and the finish is medium in length and packed with pineapple curd. I am really enjoying this wine after being in the car all day. Serving it up with some fish filets, smoky bacon Quinoa and buttered Brussel Sprouts. It firing on all cylinders. 90 points and 5 stars, buy it by the dozen for the summer. Drink now till 2020. Salut…. My son is visiting from Nashville so we decided to order some Chinese food. Faced with trying to pair reds with Mogolian Beef, Walnut Crisp Shrimp, General Tso…. I gave up and looked in the fridge. I wanted something on the lower side of the alcohol scale. This crisp Pinot Grigio rings in at 12.5%, perfect for my Far Eastern foray. It shows a pretty gold and pink hue in the glass and offers lemon zest, pineapple and green apple on the nose. On the palate it is not as crisp as I had imagined, slightly more weighty and silky. It reminds me of unoaked Chardonnay in a way. Waxy, pear, apple and citrus peel. The mid palate is really interesting with more green fruits, melon and a hint of beeswax. The finish has that classic lemon profile. This Italian Pinot Grigio is more akin to Oregonean or even Alsatian Pinot Gris with it’s heavier profile, darker complexion and flavor charachteristics. I’m not complaining, it’s a decent wine and I am enjoying it immensely with my exotic dinner. 89 points and 5 stars for this $10 wine that needs to be stocked in multiples! Drink now till 2018. Salut…. Working backwards through my wine pictures I came across this little gem. 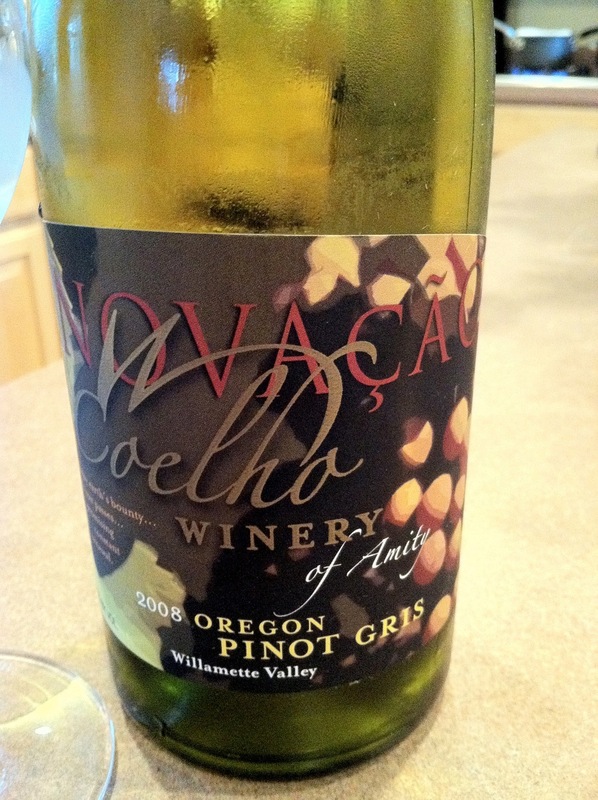 Called the Novocao and made in Oregon- the Pinot Gris is just what we needed to go with Moxie’s (the wife) “low country shrimp and grits”. A spicy dish needing some acidity and freshness, the people from Amity did not disappoint! Highly recommended and serve chilled.